I have been a fan of Great Big Sea for years, but was disappointed with their latest effort: 2008’s Fortune’s Favour. The album has but a single listenable song (“Company of Fools”) as the band strayed from their Celtic roots into unfamiliar rock territory. 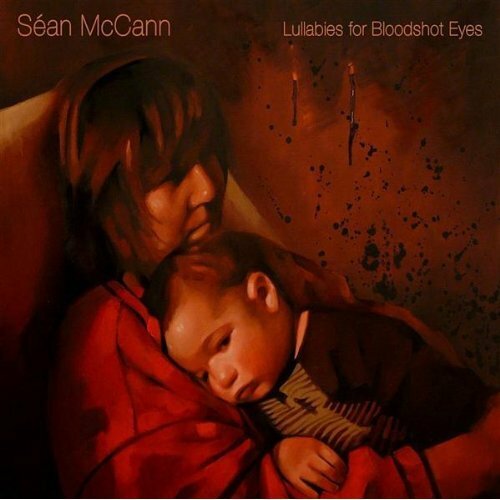 Regardless (or maybe in spite) of this, when I saw Séan McCaan was doing a solo project, Lullabies for Bloodshot Eyes, I was immediately willing to buy it without hearing a single track. I was not disappointed, but not particularly pleased either. I have a bias in favour of Great Big Sea’s earlier and more traditional work, and without Bob Hallett’s tin whistle, accordion, and dozen other instruments, Séan’s solo effort is missing the sound I expect to be supplementing his voice. Fans of Great Big Sea might also miss the variety of Alan Doyle’s voice because Séan tends to sing a lot of his songs in a similar style. For example, if you buy the album on Séan’s website, you’ll be treated to the bonus track “The Death of Queen Jane” which has a simple melody obviously inspired by “John Barbour” (on Great Big Sea’s 2004 release Something Beautiful), but at least the penny whistle makes an appearance. The major problem with Lullabies for Bloodshot Eyes is that it’s littered with clichés. I feel as if Séan was using my word of the day poetry format: choosing an overused phrase (or two) and building a song around it. The first and last songs are written for his two sons, which is endearing, I suppose, but the lullaby format bores me—as do stock lyrics like “Hush now baby don’t you cry, let no tears fall from your eyes.” Yes it’s a lullaby, but…I don’t know. I want something more original (which he does deliver later). The second track, “Wish”, is composed of pretty weak lyrics (including stock “if I die before I wake”), but then the album takes off with three of its best songs in a row. The guitar in “Peace among the Bones” picks up the pace and leads into “Hold Me Steady” (Freddy…ouch lyrics again) with its excellent orchestration. “Gone Tomorrow” was easily my favourite song on my first listen. The notes almost seem out of Séan’s range, but when Jeen O’Brien’s lovely harmony kicks in…wow. Something beautiful, indeed. “Razor & Rust” and “Lazy Lover” keep up the vocal magic, but the latter suffers from being cornier than it is funny. “Wasted”, after multiple listens, overtakes “Gone Tomorrow” as my favourite track. It has the most honest presentation, and despite its slow beginning does not have the lullaby quality the album’s title advertises. I love songs that build, and although “Wasted” never reaches the intensity of songs like “Good Night Elisabeth” (by Counting Crows) or “Wet Sand” (by The Red Hot Chili Peppers), it is expertly arranged down to the final line sung over silence. In fact, it’s a huge compliment that I think of those long songs when listening to 3:17 “Wasted”.